Lamb is a meat which is often overlooked, or seen as simply a Sunday joint, when it has so much to offer. It is flavoursome, tender, and not just for eating at Easter! 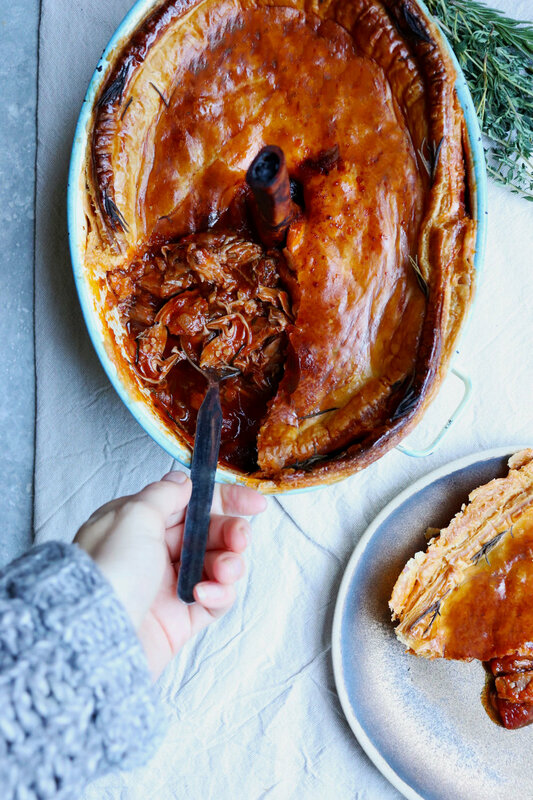 A lamb shank slowly braised in red wine is a good thing, so a lamb shank slowly braised in red wine and then encased in pastry is a VERY good thing. 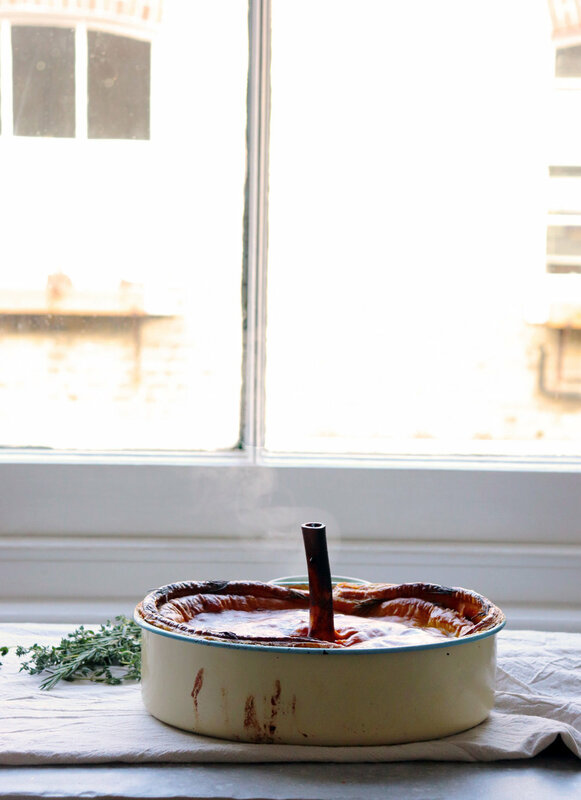 It’s good, warming, winter grub and a lovely change from a traditional shepherd’s pie. This recipe is great because whilst the cooking time is admittedly fairly long, the hands-on time to make this dish is minimal. It is a proper ‘throw-it-all-in-the-pan’ kind of shin-dig, and that is the kind of cooking I can really get behind. 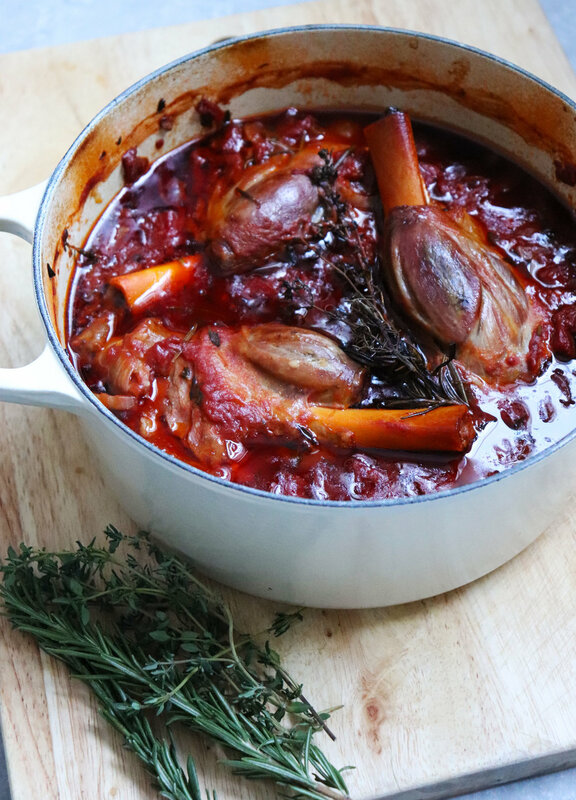 Slow-braising meat like lamb shank is where it really begins to shine. Flavours mature and develop, the fat melts into the sauce making it thick and velvety and the strands of meat pull away from the bone with no effort required at all. Once the shanks have been braised, I used two forks to shred the meat and then mix it back into the reduced sauce. This filling will keep for up to three days if you want to prepare this recipe ahead of time. By all means, make the puff-pastry from scratch in this recipe if you’ve got time! I use a shop-bought all butter puff and get excellent results, but you are welcome to make your own. Be sure to allow your filling to cool completely before topping with pastry, or the butter in the pastry will melt and you won’t get that gorgeous puff. 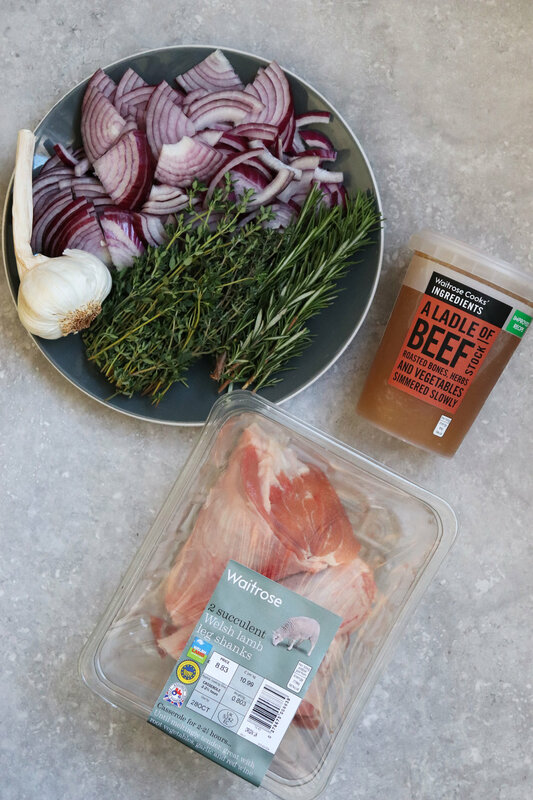 This dish is all about the lamb, and I’m using Welsh Lamb (available at Waitrose). As well as having exceptional flavour, I love the fact that it doesn’t come from too far away. So much of the lamb we see in supermarkets is imported from New Zealand which seems a crying shame when we have so much brilliant produce on our doorstep. Being mindful of where your food comes from, sourcing locally or at the very least seeking out British produce supports our farming industry and saves on air-miles which helps protect our planet – what a win! 1. Preheat the oven to 180oC. Gently fry together the red onion, garlic and chopped herbs with the olive oil in a large casserole dish over a medium heat until soft and translucent. Stir in the tomato puree, then pour in the beef stock, red wine and chopped tomatoes. 2. 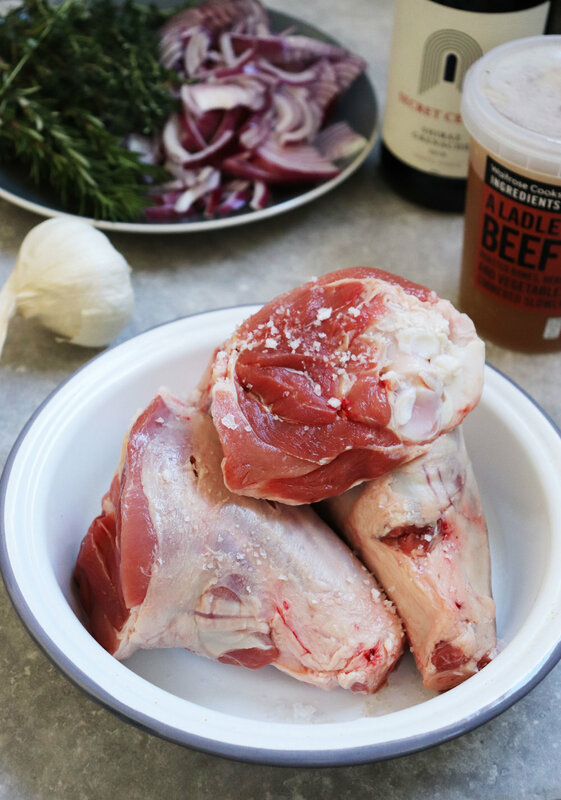 Season the lamb shanks with salt and pepper, then nestle them bone-up in the liquid mixture. Cover with the lid and place the casserole dish into the oven. Slow-roast the lamb for 3 – 3 ½ hours, or until the meat is falling off the bone. Remove from the oven and allow to cool for 20 minutes. 3. 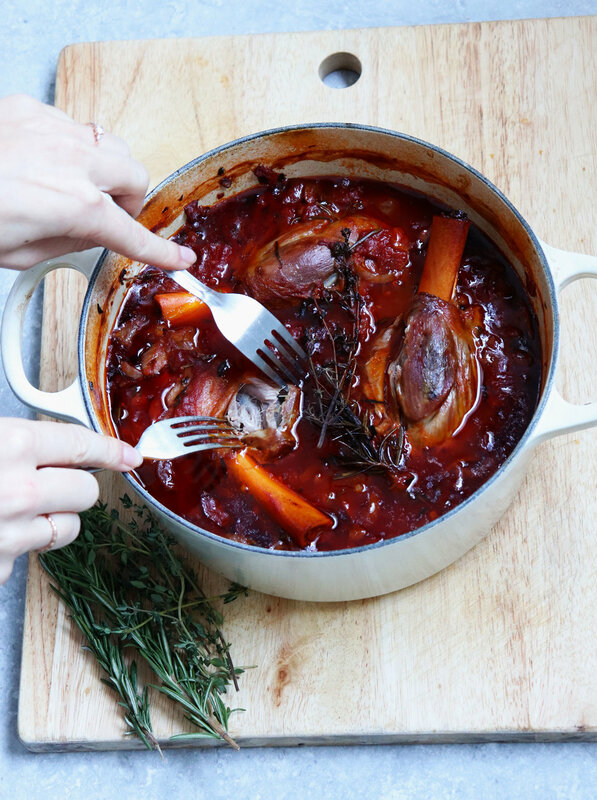 Lift the lamb shanks from the cooking liquid and use two forks to shred the meat. The cooking liquid should have reduced and be gravy-like in thickness, but if it still looks quite watery, return the pan to the hob and heat until the water has evaporated and you are left with a glossy sauce. Give it a taste and season with more salt and pepper if you think it needs it. Return the shredded meat to the pan, cutting off and discarding any large fatty pieces, then tip into a pie dish and place into the fridge to chill until completely cold. The filling will keep for up to 3 days at this stage. 4. Preheat the oven to 200oC. Unroll your puff pastry sheet and cut an oval slightly larger than your tin size. Wedge one of the lamb bones into the centre of the pie filling and make a small incision in the centre of the pastry oval. Carefully lower the pastry onto the pie, allowing the bone to poke through the hole. 5. 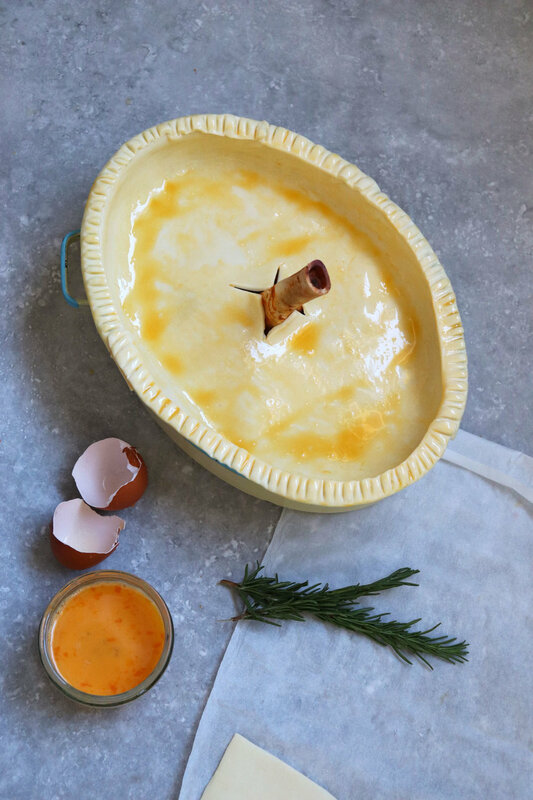 Cut the remaining pastry into strips and apply to the edges of the pie using egg wash. Use a fork to crimp the sides, then egg wash the whole pie and stick rosemary springs around the top. 6. Bake the pie for 25-30 minutes or until the pastry top is crisp and golden and the filling is piping hot. Serve immediately with buttery mash and freshly steamed greens.